From aesthetics to privacy and sun protection, learn about popular options for glass. 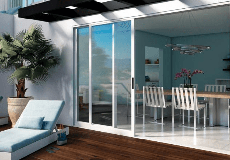 Have you ever thought about your window and patio door glass? You probably have unique needs in every room of your home, depending on the direction your windows face. One side could benefit from sun protection and another may need privacy. Because our windows and patio doors are custom made, you can select different types of glass for each individual window or patio door to address a variety of requirements. Obscure patio door and window glass helps protect your privacy while allowing abundant light to enter the room. A variety of colors and texture patterns are available for a translucent to semi-opaque effect. Obscure glass is perfect for places like bathrooms. Tinted door and window glass provides additional shading from direct sunlight and warm conditions. It also provides privacy by reducing visible light transmittance to the outside. There are various tints available through Milgard to achieve the energy performance or architectural style that is desired. These tints include Solar Bronze, Solar Gray, Graylite, Solex, Evergreen and Azurlite. Craftsmanship and artistry are combined for distinctive elegance with Milgard Crystal Groove, adding an extra spectrum of light and design that will bring any room to life. Crystal Groove can have a ground (matte) finish that allows the light to accentuate the design or a polished finish that reflects the light. It can be applied to most glass and is perfect for doors and windows. Laminated glass (two or more panes of glass bonded together with a plastic inner layer) is highly effective in reducing noise. It also eliminates 99.9% of ultraviolet rays, providing the highest degree of protection from the sun for your home furnishings. Plus, if it is broken, glass fragments adhere to the plastic interlayer rather than falling free and potentially causing injury. Tempered glass is extremely strong and often used for its safety characteristics. Not only is it extra strong but, when it breaks, it breaks into little pebble-like pieces without sharp edges. Tempered glass is ideal for reducing the likelihood of injury in the event of breakage in applications like patio doors and side lights.